Melbourne Airport Motel features a terrace. Wireless Internet access is complimentary. A roundtrip airport shuttle is complimentary for guests (available on request). On-site self-parking is complimentary. Melbourne Airport Motel has designated areas for smoking. This motel features free self-parking, free WiFi in public areas and a free airport shuttle. All 15 rooms feature comforts such as pillowtop beds and Egyptian cotton sheets, while conveniences include fridges and microwaves. Complimentary wireless Internet access and balconies or patios are standard, as are Smart TVs with Netflix. 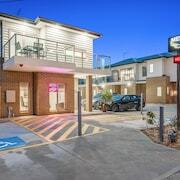 Melbourne Airport Motel offers 15 forms of air-conditioned accommodation with minibars and a safe. Rooms open to balconies or patios. Pillowtop beds feature Egyptian cotton sheets and premium bedding. 32-inch Smart televisions come with Netflix. Guests can make use of the in-room fridges, microwaves and coffee/tea makers. Bathrooms include a shower, complimentary toiletries and a hairdryer. Guests can surf the web using complimentary wireless Internet access. Business-friendly amenities include desks and telephones. Housekeeping is provided on a daily basis.